"My rhymes are so potent that in this small segment, I made all of the ladies in the area pregnant." For those of you who haven't had the pleasure of The Flight of the Conchords, here's the video that this excerpt relates to. Good kiwi boys. Anywho, on a semi-related note. Who would put their hands up for Blogcamp NZ (or New Zealand for those of you who aren't as educated as the rest)? Just putting it out there... seeing what kind of reaction I get. * bloggers come from four corners of the globe, for as long as they like, but crossing over for about five days of blog camp somewhere like this or this or this. * Around Feb/March next year? * I'd help you guys with everything from what to do and where to go before and after the blog camp, and I'd even greet you with a complimentary beverage once you make it to Auckland city. So. Hands up. Who's interested? Do we look into this further? Or is it a preposterous hypothethis? Still looking into it, and combining it into a hol with the Hubs in Australia. Oh I'd love to, but it's way too early in the year for me. Shame! Kidding aside, am really planning this. in the spirit of both writing is the new praying and what are you gonna remember, i'm gonna say this sounds like a great idea. Can't do end of 2010, since we'll be most likely moving continents around that time. Priorities people! Stop eating and start saving. money-wise feb-march next year is not looking good, but nov/dec could definitely be done! I'm in! Yay! I could almost definitely do November/December next year! I have a plan! :) I'm SOOO excited already! oh wow... how exciting would this be?? I'm liking this... Extrajera, you can come feb/march and we can have our own private band camp??? Yes the wine is a goer and no you shouldn't give it up. 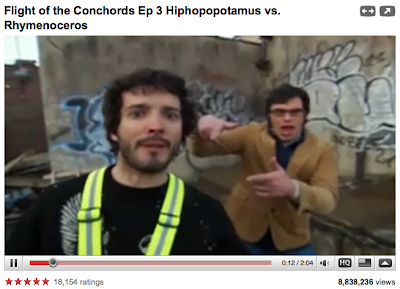 i LOVE flight of the conchords, and ESPECIALLY this episode. Oh a blog camp much closer to home. I would like to attend late in 2010 if possible especially if Polly is going to be there. Great idea. I'll have to check back in and see what transpires. What a wonderful idea! I have often thought that it would be so good to meet up with some of my blog pals. Flight of the Conchords is hysterical...I love that show! !